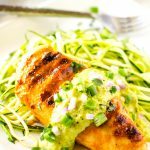 This Smokey Chicken with Avocado Sauce is an easy to make low-carb meal that the whole family will love! I’ve mentioned before that my Grandmother was diagnosed with diabetes and successfully managed it through lifestyle choices for many years. I remember this so clearly, because when she shared her diagnosis with us, I thought it was a death sentence. I was terrified. Instead, the next time I visited her, she was thinner than I ever remembered and seemed a bit more vibrant. I watched her diligence at sticking to her “new plan” through the years and learned a very valuable lesson – our lifestyle choices can make a tremendous difference in our lifespan. Her experience has lead me to get proactive when it comes to managing my blood sugar. This is particularly the case as I get older. Everyone is different, but I find that I feel my steadiest on a diet that is high in protein and healthy fats. I adore carbs but find I am my best when I don’t overdo it. Of course, everyone reacts to food in different ways, and you should always work with your health care professional to discover what works best for you. 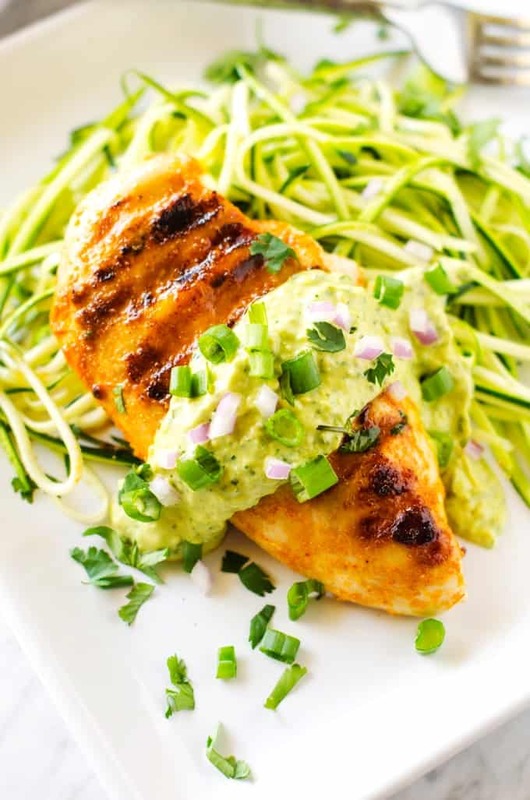 Today’s Smokey Chicken with Avocado Sauce is just the kind of meal I adore. Rich in protein and the right kind of fat, it keeps me steady and at my best. 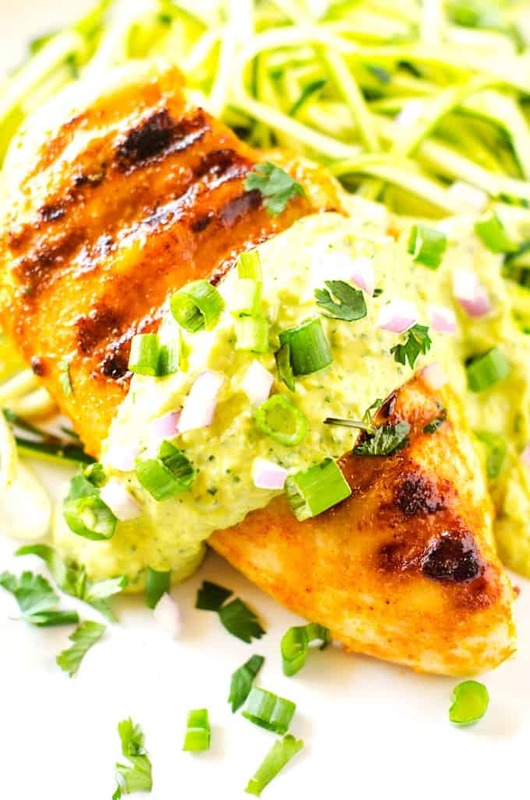 This Smokey Chicken with Avocado Sauce is not only healthy but delicious. 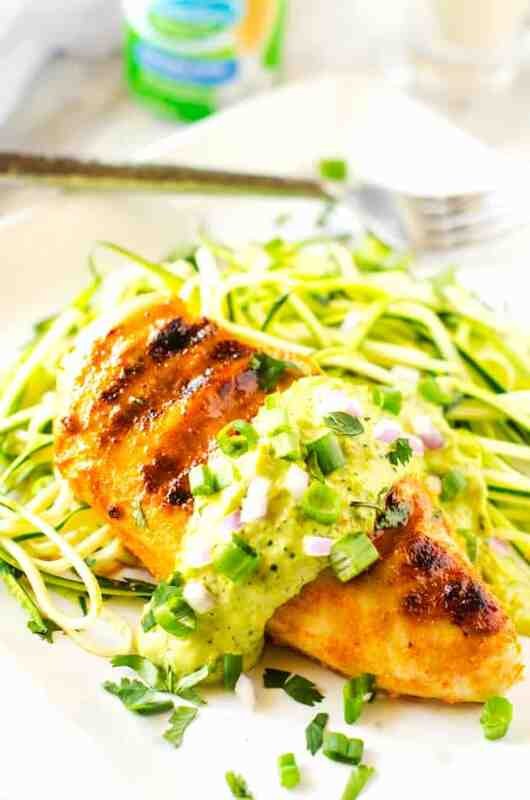 The creamy avocado sauce is perfect served over pasta or zoodles. Being dairy free makes it so hard to adapt some recipes, but sure I could do this! Yes – just used dairy free yogurt or homemade mayo! I love the simplicity of this recipe! And such a yummy combo too. I agree that I feel so much better when I eat protein and healthy fats than carbs alone. But I do love my carbs!! I am the same way! If it weren’t for how they make me feel, I’d be happy on nothing but carbs. When I had gestational diabetes with both my pregnancies, I loved glucerna! This chicken sounds fantastic, especially the smokiness of the chicken! What a delicious-looking recipe Wendy! Your ideas are always fabulous. Love anything with avocados. They are so versatile and yummy. I know – me too! I could eat them three meals a day! This looks so flavorful! Love the marinade for that chicken. Recipes vary but generally eggs, oil, mustard, lemon juice, salt and pepper. Wow what a wonderful recipe! My mom is diabetic but sometimes she craves for certain foods that isn’t allowed for her but I’ll definitely make this one for her. Hopefully, it’ll look and TASTE like what you did. Thanks for sharing this! What sides can you make with this to keep it anti-inflammatory? I like this with Zucchini Noodles or Mashed Cauliflower. The recipe says 16 ounces of chicken – then says 14 ounces of boneless chicken breast. Please clarify!